Readers have to proceed to paragraph seven of the article to get past that sensationalist framing and find out what was really said by the police commissioner trying to combat the phenomenon of over-policing which is of course evident in many democratic countries, including the UK. “At a meeting of the Israel Bar Association in Tel Aviv on Tuesday, Mr Alsheich was asked why Ethiopian-Israelis appeared to be singled out by his force. “Studies the world over, without exception, have shown that immigrants are invariably more involved in crime than others, and this should not come as a surprise,” he responded. Research had also shown that young people in general were more involved in crime and that “when the two come together, there’s a situation in which a given community is more involved than others in crime, statistically speaking”, he added. The commissioner said this had been the case “in all the waves of immigration” to Israel, and “also with regard to [Israeli] Arabs or [Palestinians in] East Jerusalem”. “When a police officer comes across a suspicious person, his brain suspects him more than if he were someone else. It’s natural,” he continued. That article has not been updated to clarify that the incident was the subject of a subsequent investigation which indicated that the BBC’s use of the word “unprovoked” is inaccurate. “Attorney General Yehuda Weinstein said Sunday he will close the criminal investigations against both the police officer who manhandled Ethiopian-Israeli soldier Demas Fekadeh and against Fekadeh himself. The incident in early May was caught on CCTV and sparked angry protests by thousands of Israeli Jews of Ethiopian descent in Tel Aviv and elsewhere. “One of the early incidents that exposed this approach was the revelation in the 1990s that the Israeli national blood bank had routinely destroyed blood donated by Ethiopian Israelis for fear of HIV. Once again we see that in its haste to promote a story which portrays Israel as a country rotten with racism, the BBC has sidelined editorial standards of accuracy. The May 19th edition of that programme (available here) purported to address an issue which has indeed recently been making headlines in the UK. Serious discussion of that topic would obviously not be enhanced by having one-third of the invited panel taken up by a person who subscribes to the view that it is no more than a “scam to smear Labour activists” and who has in the past collaborated with notorious propagators of conspiracy theories in order to promote her anti-Israel propaganda. Leaving aside Mendoza’s medically ignorant and obviously inaccurate portrayal of (temporary) contraception as “sterilization” (a procedure designed to be permanent), the fact is that her completely baseless slander – which has unfortunately appeared in BBC content before – was disproved in a report published by Israel’s State Comptroller in January of this year. “There is no evidence that Ethiopian women who immigrated to Israel were required to take birth-control shots against their will, State Comptroller Joseph Shapira wrote this week in a letter obtained by Haaretz. So how did the programme’s host David Aaronovitch react to that very transparent promotion of a Nazi analogy based on what is known to be a blatant lie? He allowed her to continue unchallenged. Listeners do not get an answer to the curious question of how Mendoza managed to find “a Jewish Israeli” in the Gaza Strip nine years after all the people answering that description were evacuated from the territory, but they do get to hear David Aaronovitch pass the buck to David Hirsh. DH: “Well, I think we need to talk about what the Nazis did. The Nazis created a racial categorization of human beings. They created an industrial network in order to round up, identify and gas and murder all of the Jews of Europe. Now, Kerry-Anne’s story about…ehm…one incident in which some people were given long-term contraception is a really good example of how particular incidents are used to kind of demonise Israel. The claim that there was a campaign to stop black people from breeding in Israel is just appalling actually. It’s not true, when in fact black people have been brought and rescued and brought to Israel and are part of Israeli society – a half of Israeli society…. At that point Aaronovitch interrupts and redirects the discussion elsewhere. The question which must be asked about this particular segment of the programme (which includes additional material no less worthy of comment) is what impression the average listener would have taken away. On the basis of past evidence one can well assume that the BBC’s response to any complaint on this issue would be to claim that Mendoza’s allegations were rebutted by David Hirsh. However, listeners would not have understood from David Hirsch’s response that an official investigation had taken place or that it found no evidence of the administration of Depo-Provera to Ethiopian women against their will. In fact, Hirsch’s reference to “one incident in which some people were given long-term contraception” would have prompted the average listener to go away with the mistaken idea that there is a factual basis to Mendoza’s deliberate smears. Moreover, the BBC itself – in the form of its presenter – made no effort to ensure that audiences were made aware of the facts behind that slander and actually left listeners to make up their own inadequately informed minds with regard to who is telling the truth – Mendoza or Hirsh. Any serious examination of the question of “why might a left of centre, progressive, pro-minority party have a problem with Anti-Semitism?” would necessarily include recognition of the fact that a major contributing factor to that phenomenon is the deliberate demonisation and delegitimisation of Israel by far-Left activists. In other words, by failing to adequately challenge Mendoza’s mendacious propaganda, this programme – which is also being promoted by the BBC on social media as a podcast – lent a helping hand to the spread of the blight of anti-Jewish racism it purported to discuss. Nearly three years ago, in February 2013, the BBC Jerusalem Bureau’s Yolande Knell produced an article which appeared on the BBC News website’s Middle East page under the headline “Israeli Ethiopian birth control to be examined“. As was documented here at the time, Knell’s report was actually no more than a rehash of an article which appeared on the same day in the Ha’aretz newspaper. In the same article Knell also misrepresented another much older story connected to Israel’s Ethiopian community in order to pad out her insinuations of racism. Ha’aretz subsequently corrected the article upon which Knell’s report was based but no amendment was made to the BBC’s article, which still remains available online. Israel’s State Comptroller (Ombudsman) has now completed an investigation into the allegations. Yolande Knell’s ugly smears never had any verified, factual basis but nevertheless the BBC allowed her inaccurate article to become “historical record“. Obviously, it is high time for the BBC to make amends by appending a note to the article which explains that its content is inaccurate and misleading. It is always a pleasure to be able to document some good BBC reporting on an Israel-related story – especially when the subject matter has been the topic of less than satisfactory journalism in the past. On December 13th BBC One screened a documentary titled “Saving the Forgotten Jews“. The programme is available in the UK on iPlayer or here. 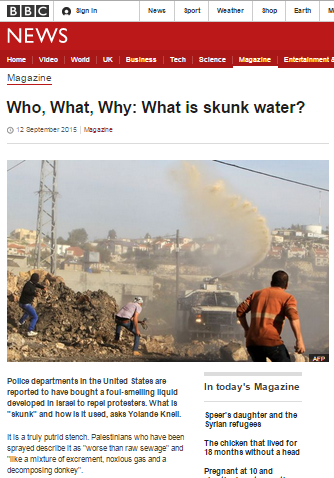 On September 12th the ‘Magazine’ section of the BBC News website published an article by Yolande Knell titled “Who, What, Why: What is skunk water?“. The hook for Knell’s article is evident in the article’s opening paragraph. However, only those 31 words and a further 39 towards the end of the article relate to the reported purchase of the riot control method by US police departments. The report’s remaining 627 words are employed by Knell for more of her signature political campaigning. One of the article’s notable features is the language used by Knell to describe the circumstances in which the Israeli security forces use Skunk spray. “Protesters, demonstrators, rallies”: none of Knell’s chosen terminology contributes to audience understanding of the fact that Skunk and other methods of crowd control are in fact used against violent rioters. The only hint concerning that comes in a quote from the IDF but Knell herself refrains from clarifying the issue to readers, leaving them with the mistaken impression that Skunk is used against people marching quietly with placards. “Israeli security forces have been accused of misusing the stinking liquid. Last year police sprayed large quantities of it in East Jerusalem neighbourhoods, at a time of widespread unrest. The Association for Civil Rights in Israel complained that this was “disproportionate“, affecting the lives of tens of thousands of Palestinians. The local NGO most quoted and promoted by the BBC in its Israel-related content in 2014, B’Tselem, provides the video embedded in the article – and apparently the source of an unverified allegation – as well as a quote. “In the West Bank village of Kafr Qaddum, skunk has been used to break up weekly rallies against Israel’s closure of a nearby road. The protest organiser claims his home has also been singled out. The IDF said it was not aware of such an incident. “For us it’s a complex picture,” says Sarit Michaeli of the Israeli human rights group, B’Tselem. The inclusion of the terms “disproportionate” and “collective punishment” – both of which have legal connotations not relevant to this story – is of course particularly notable given the BBC’s similar misuse of legal terminology during Operation Protective Edge, often whilst amplifying the agendas of political NGOs engaged in lawfare. She neglects to inform readers that the use of Skunk in Jerusalem on April 30th came about after the protest turned violent and does not disclose her source for the claim that in that case the solution was “possibly diluted”. It is becoming increasingly difficult to find any Israel-related report by Yolande Knell which does not promote her embarrassingly transparent political agenda. Not infrequently her work (and that of other BBC journalists too) relies on contributions from a selected group of political NGOs, without any effort being made to duly inform BBC audiences of the agenda which lies behind their claims and statements. Yolande Knell clearly has no qualms about acting as a medium for foreign funded Israeli NGOs but that of course is not the same as accurate and impartial reporting of the news – which is, after all, what licence fee payers are entitled to receive. 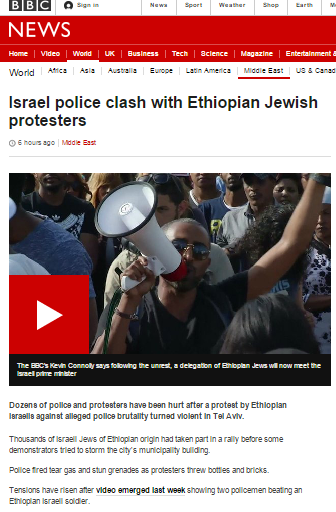 A written article on the BBC News website’s Middle East page now appearing under the title “Israel police clash with Ethiopian Jewish protesters” – originally headlined “Teargas used as Ethiopian Jews protest in Israel”. 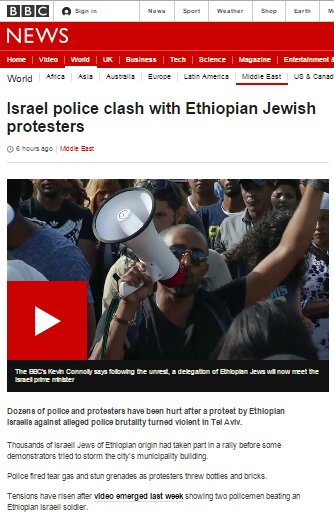 A filmed report by Kevin Connolly which, in addition to appearing on BBC News programmes, was also publicized on the BBC News website under the title “Israeli police use tear gas during Ethiopian Jewish protest“. A report by BBC Arabic’s Michael Shuval on the BBC World Service radio programme ‘The Newsroom‘. An item on the BBC World Service programme ‘Newsday‘. 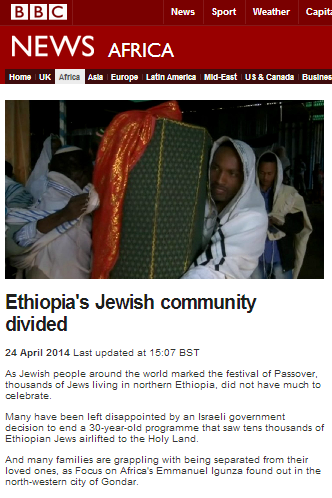 Another written article which appeared on the BBC News website’s Middle East page on May 4th under the title “Israeli Ethiopian protests ‘reveal open wound’, president says“. All in all, the reports are reasonably balanced and accurate but a few points are worthy of note. The BBC does not inform audiences that the May 3rd demonstration followed an earlier one in Jerusalem on April 30th in which major roads were also blocked and violent incidents were also reported. “The protest started with a few hundred protesters and grew to around 1,000 by the evening, moving from the police HQ to the center of the city, a short distance from the Prime Minister’s Residence. Later in the night, the protesters blocked the intersection between King George St. and Jaffa St. The BBC also does not clarify that neither of the two protests had been authorized by the police. Despite that fact, the police allowed the Tel Aviv demonstration to continue as long as it remained peaceful. “Tel Aviv police chief Yohanan Danino told Channel 10: “The use of violence by a small minority of the many protesters does not serve their struggle. “The commander of the North Tel Aviv precinct, Chief Superintendent Nissim Daoudi, claimed that “anarchist groups” had taken advantage of the protest to clash with police. One of the demonstration’s organisers, Gentu Mengisto (head of the Ethiopian students’ association), told Channel Two that “groups took advantage of the protest for their own ends” and “we were joined by all sorts of organisations that provoked everything”. Clearly this is a relevant aspect of the story which has been omitted from the BBC’s many reports. 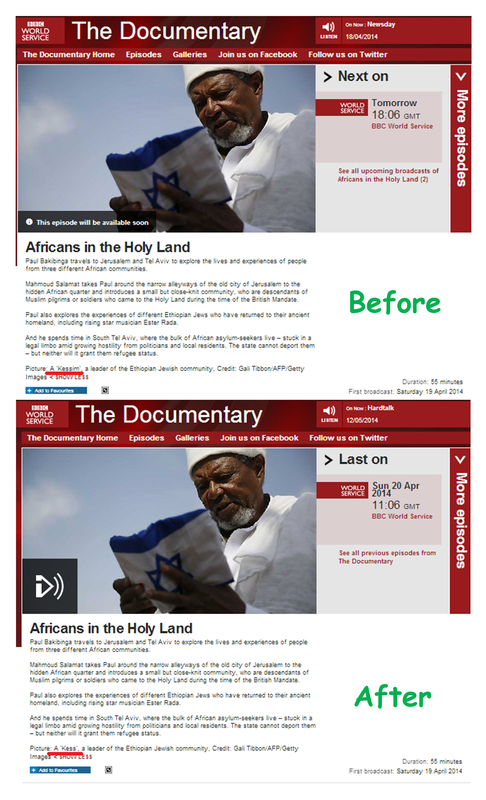 Last month we noted the then imminent broadcast of an edition of the ‘Documentary’ programme titled “Africans in the Holy Land” on BBC World Service radio. Since that post was published, the grammatical error in the picture caption on the programme’s webpage has been corrected. The next fifteen minutes or so of the programme are devoted to the stories of three migrants living in the Tel Aviv area – two from Eritrea and one, Oscar Oliver of the ARDC, from the Democratic Republic of Congo. In addition, listeners hear the words of two more migrants at the Holot detention centre. Bakibinga makes no substantial attempt to find out whether or not the migrants are indeed refugees or economic migrants and fails to clarify to audiences that approximately 85% of those who have entered Israel since 2006 are males between the ages of 21 and 40. He dwells on the subject of “the language that the politicians are using”, but fails to clarify that his reference actually relates to a small number of Israeli politicians rather than all of them, as implied. Whilst blaming tensions between migrants and local residents in south Tel Aviv upon the language used by unnamed, unquantified politicians, neither Bakibinga nor his interviewees make any attempt to inform listeners of other very relevant issues such as the crime in those areas. Likewise Bakibinga makes no attempt to correct the inaccurate impression given by Oscar Oliver that all the migrants “are put in this same place, in this same neighbourhood”. Some six minutes of the programme are then devoted to statements from the deputy spokesperson of the Foreign Ministry and Professor Amnon Rubinstein. Bakibinga fails to make any attempt to explore the subject of why only 1,800 of the migrants have actually applied for asylum. After some four minutes of news and promotions, Bakibinga turns his attentions to the subject of Ethiopian Jews in Israel in a section lasting just over thirteen minutes. His interviewees are Ester Rada (whom he describes as having grown up in “an Israeli settlement…in the occupied West Bank”) and Shira Shato, along with Shira’s husband Shlomi Assoulin. During the conversation with the latter – the son of immigrants from Morocco – listeners are told that Zionism is a European phenomenon and encouraged to view Israel as a society in which there is discrimination and prejudice against Ethiopians and “Jewish Arab people”. The next ten minutes of Bakibinga’s programme are located in Jerusalem and are dedicated to Mahmoud Salamat and others “who are Palestinian, but have their roots in Africa”. Bakibinga makes no attempt to clarify why – or by whom – Salamat’s family were “kicked out” of an area conquered by Jordan and occupied for the next nineteen years. The conversation then continues to a decidedly curious portrayal of the Entebbe hijacking. Bakibinga makes no attempt to clarify whether Salamat’s 17 years in prison were actually “as a result of being a member” of the PFLP, or whether in fact they were the consequence of terrorist activity. 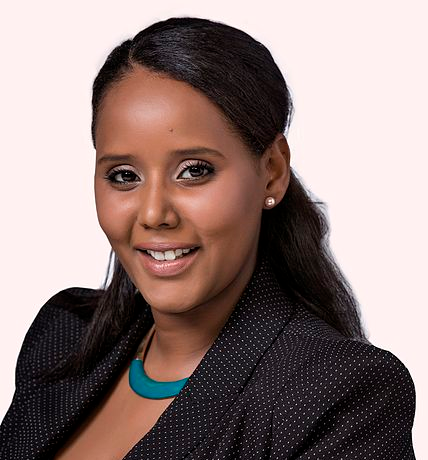 The final three minutes of Bakibinga’s programme are dedicated to a conclusion which promotes the message of discrimination against an Eritrean woman who gave birth in an Israeli hospital, a man from the DRC who is “still without refugee status” and Ethiopian Jews who do not “feel at home” and are not “part of this society”. As has been the case in previous BBC coverage of the topic of African migrants, no attempt is made to place the stories promoted to listeners within the context of the treatment of migrants and asylum seekers in other countries. Neither is any attempt is made to place the experiences of Ethiopian-born Israelis within the context of the experiences of other immigrants to Israel (or indeed to other countries) from non-African countries. Instead, Bakibinga opts to focus on the emotional aspects of the stories he elects to tell and listeners are clearly intended to take away a message of across the board prejudicial and discriminatory treatment of people of African descent in Israel, regardless of how they happen to have arrived there. That message is particularly relevant in light of another BBC report which appeared just a few days after Bakibinga’s programme: more on that in an upcoming post.